Redwood City presents Salsa Festival, a free community celebration on September 29th. The festival guarantees a fun-filled day of tongue-tingling salsa, great activities, music and entertainment, food, beverages, and a wonderful time for the entire family from noon until 8 pm. Downtown Redwood City calls for individuals, teams, amateur and professional chefs to compete for fun, prizes and, salsa glory in the Salsa Tasting & Competition at the Salsa Festival. Teams can enter the salsa challenge as an individuals, or businesses. Choose between the categories of Mild and Hot. 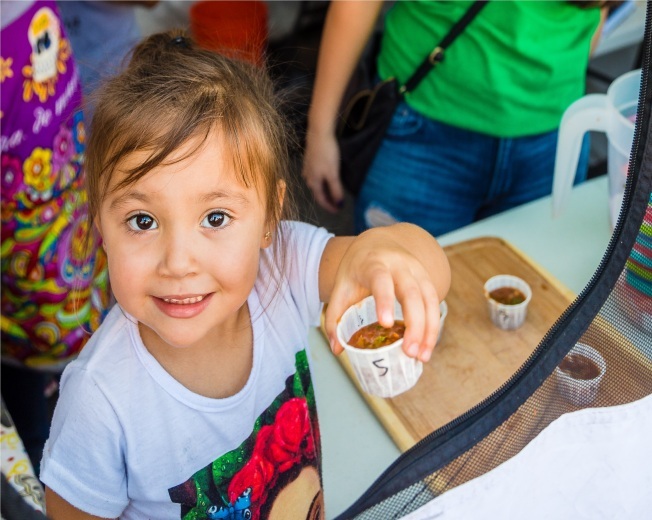 The festival goers will be able to purchase a tasting kit in order to cast their vote for the “People’s Choice Award.” Salsa will be judged by a qualified panel of judges based on aroma, consistency, color, appropriate heat level, taste and after-taste. This panel will also judge each team booth for Best Decorated. The top winning is a $750 prize for the People's Choice Best Salsa! Plus special prizes this year, $500 prize for 2nd place and $300 prize for 3rd place. Also, $400 prize each for Best Hot Salsa and Best Mild Salsa and $400 prize for Best Decorated Booth. The Salsa, including prep work, must be done on-site at the event, and contestants must bring all equipment necessary for making their salsa. Canned ingredients are acceptable including tomatoes, tomato sauce, chilies, onions, garlic, salt, lime, and various spices, however all ingredients must be mixed together on-site. Pre-made or pre-mixed salsa will be disqualified from the competition. Please note: Teams make a minimum of 10 gallons of salsa, and the 5pm end time is our best estimate and is dependent on how much the public tastes! Fees are $50.00 for Professionals (Caterer/Restaurant) and $50.00 for individual teams. Downtown Redwood City calls for individuals, teams, amateur and professional chefs to compete for fun, prizes, and salsa glory in the Salsa Tasting & Competition at the Salsa Festival. Teams can enter the salsa challenge as an individuals, or businesses. Choose between the categories of Mild and Hot. The festival goers will be able to purchase a tasting kit in order to cast their vote for the “People’s Choice Award.” Salsa will be judged by a qualified panel of judges based on aroma, consistency, color, appropriate heat level, taste and after-taste. This panel will also judge each team booth for Best Decorated. The top winning is a $750 prize for the People's Choice Best Salsa! Plus special prizes this year, $500 prize for 2nd place and $300 prize for 3rd place. Also, $400 prize each for Best Hot Salsa and Best Mild Salsa and $400 prize for Best Decorated Booth.